Apple shapes, rejoice! We're here right now to chat about how you, yes you can dress your shape and play up your most favorite features. Before we get started, let's get one thing straightened out—inverted triangles and apple are somewhat synonymous. Both shapes are known for their broader shoulders, but typically, true apple shapes carry a little more in their midsection while inverted triangles do not. 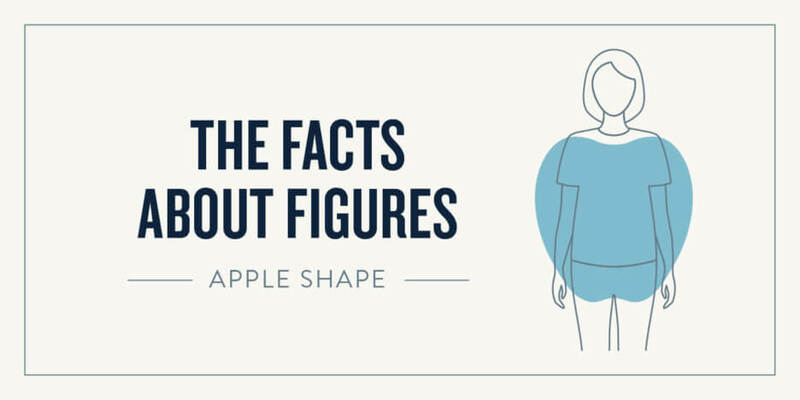 No matter what features you want to flaunt (or conceal), we've got your covered with this 5-step guide to dressing your apple shape figure. So what’s an apple shape, anyway? When it comes to styling the apple shape—life is sweet! Apple and inverted triangle shapes look best when playing up their full bust, their amazing legs and/or their arms. In general, silhouettes that don’t rely on a traditionally structured waistline are your hardest working pieces. 1. Start at the top! Looking for more structure? Choose a substantial fabric that will streamline your look from your bust through your hips. Fabrics like raw silk, linen, tweed, gabardine and thicker cotton (avoid jersey—it can be thin!) will all do the trick. So, what about sleeve length? This is where rules go out the window. If you love your arms and shoulders and are proud of those push-ups, go strapless or sleeveless! If you prefer to cover up, try a more fitted sleeve to help balance your fuller bust and midsection.If you’re on the curvy side, elongate your neck with plunging (or shallow) V-neck or scoop-necks. More of a “downplay” kind of girl? Look for a higher neckline in a dark shade like black or navy. As is true with every shape, where your jacket hem hits will make all the difference. Apple shapes look great in any vest, coat or jacket that hits at the hip or upper thigh. A-line coats or straight, knee-length trench styles (without the waist belt) will be super flattering, and you can pull off a poncho like it’s your job. If you love a great dress—you’re in luck! Strapless styles look great on you. Maxi styles with a lower neckline are super flattering, and a wrap dress can be your secret weapon (avoid “wardrobe malfunction” moments by wearing a cami underneath). If you like your legs, go mini all the time. If not, then knee-length shift and sheath styles look great too! A-line styles are great for curvy apples. And when in doubt, diagonal stripes and darker colors are always slimming. Take your pick! Skinny jeans and leggings look great on your shape, especially when paired with a breezy tunic, oversized sweater or generous button-down. Flares with heels are great for elongating your silhouette. If you have long legs, feel free to wear bootcut or flared pants with flats. Remember that the hem should either come to the top of your heel, or all the way to the ground. Classic trouser fit, cropped, ankle… you can pretty much pull them all off! As a good rule of thumb, if your top is very breezy, you’ll want to grab a more structured or skinny pant to balance your look. Love bracelets? Statement rings? Oversized earrings? You’re in luck! Necklaces too, but since dressing for any shape is all about balancing proportions, you’ll want to make sure to draw the eye up and down with a longer length, or keep it light and delicate. Everybody and every body is different. If you’re not an apple shape through and through, think of mixing and matching shapes to find the right fit for you. These dressing guidelines are best used as a starting point!